What better choice for a high-carb meal than the undisputed king of carbs, pasta. Tossed in a rich cashew-cream sauce, this delicious, fresh meal is completely vegan, but you can substitute your favorite cream-based sauce if you prefer. Blend the soaked cashews with water, nutritional yeast, and lemon. Season to taste with salt. Bring a large pot of salted water to a boil. Add the pasta to the water and stir occasionally to prevent noodles from sticking together. Cook for 8-12 minutes, until desired tenderness is reached. Drain the cooked pasta, but reserve a little bit of the pasta water. 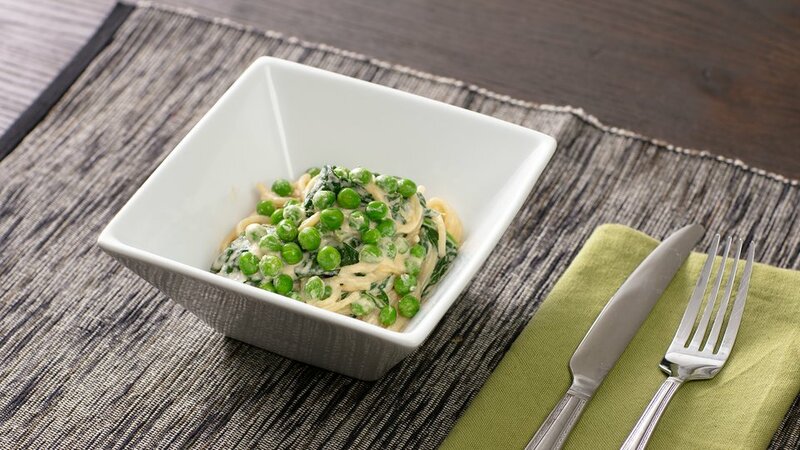 Toss the hot cooked pasta in a mixing bowl with the peas, spinach, and cashew cream. If it looks a little too thick, add some pasta water to achieve desired consistency.